The combination of crisp autumn mornings, leaves turning colour and your colleagues grumpy from whatever they are giving up for lent can only mean it is time for Easter. To me, it is a time to indulge in some hot cross buns. 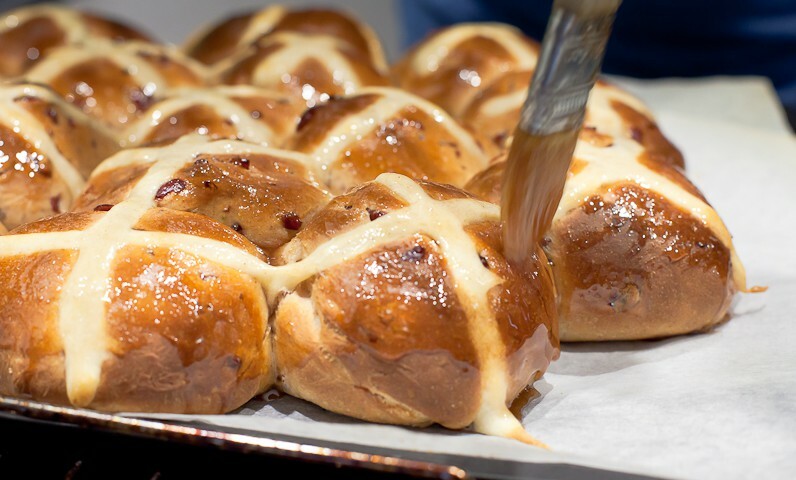 The hot cross buns have a rich history. It is thought that it originated back in 1733 but it goes further back than that. The Ancient Greeks would bake small loaves of bread to mark spring. The Pagan Saxons would slash their baked bread with crosses to honour the goddess of spring and fertility. And the Egyptians would offer breads marked with ox horns as offerings to the goddess of the moon. Such an ancient sign on a loaf of bread, of course, comes with a series of superstitions and legends. Many believe that a bun baked on Good Friday will never go mouldy and if they bun was hung in the kitchen, it would improve a cook’s baking. Sharing a hot cross bun with another is supposed to ensure friendship throughout the coming year. Others believe that the buns should be kissed before being eaten. Elizabeth David’s book on ‘English Bread and Yeast Cookery’ made reference to how Elizabeth I restricted London bakeries from making crossed buns “except it be at burials, or on Friday before Easter, or at Christmas”. A tradition that has been perpetuated to this day. This year, rather than purchasing them, I decided to make my own hot cross buns from scratch. The stretch of miserable weather we had in the past week did help in the decision making process. The process of making the buns is not as complicated as it seems. In fact, with an electric mixer handy, it really is just combining a rich mix of butter, milk and eggs into the dry ingredients, which is usually flour, spices, dried fruit and sugar. The recipe I used was an adaptation of the recipe in the latest Gourmet Traveller issue. Proving the dough in this recipe remarkably takes a short time – approximately one hour. Others like Nigella proves her dough overnight which she claims to give a better result. Flavouring the milk with cardamom or nutmeg will also give it that extra lift in the flavour but some have included beer or stout in making the dough. Mixed peel is a common option to use but consider candied citrus rind, dried cranberries or dried figs. The cross is made with a mix of flour and water although traditionally, it was made with shortcrust pastry. If you are feeling particularly adventurous, you can always try using what some American recipes suggest – cream cheese. The pièce de résistance is the glaze. This recipe I used combined sugar, mixed spice and a little water to create an aromatic and sticky glaze. There is no one way to make the hot cross bun, there is though, one sure way of eating it – with loads of butter. Happy Easter.